Home › Toys › Kiddey Knight's Castle Kids Play Tent -Indoor & Outdoor Children's Playhouse ..
Kiddey Knight's Castle Kids Play Tent -Indoor & Outdoor Children's Playhouse .. UNLIMITED IMAGINATION-Thanks to its unique and smart Knight's Castle kids Play Tent design it will make your kids imagination run wild. Countless scenarios with kings and queens will be created and the fun will never stop! TOP QUALITY MATERIALS-This splendid kids play tent is manufactured from the highest quality polyester on the market. That is why the final product you will receive is strong and extremely easy to clean and will keep your children satisfied for many years to come! LARGE DESIGN-We have carefully designed the body of the castle Playhouse to be comfortable and safe for more than one person (40 inch Diameter, 53 inch Height). After all no one wants to play alone. Keep your children and their friends active and occupied with just one toy! FOR INDOORS OR OUTDOORS-Kiddey's remarkable product will fit perfectly in any room or can easily be placed on the garden or in a balcony, Thanks to the added ground pegs. These ensure that your Play Castle stays firmly in place and doesn't move even during times of relentless playing!. The front door and mesh windows will keep the unwanted bugs and flies away making completely safe for use all seasons! EFFORTLESS SET-UP Set it up fast and easy Due to its pop-up construction, the tent can be set up easily by adding the 4 poles and can dismantle in minutes! Simply use our practical, step-by-step instructions for quick set it up without struggling, you will also be equipped with a free durable carrying bag to transport or store it hassle free without losing any parts! Win Every Little Kidâ€™s Heart With The Most Special Castle Play Tent By Kiddey!Are you in search for the best gift idea, but donâ€™t want to spend a fortune?This Castle is by far the most unique and beautiful present you can give toyour children! Learn Why Kiddeyâ€™s Castle Is The Only Thing You Are LookingFor! Â· A play tent like this will promote and increase every kidâ€™s imaginationand strengthen his intelligence while playing! Â· It keeps your little onesoccupied and active, far from the harmful electronic gadgets and games! Â· Itis perfect for many activities, indoors or outdoors all year round due to itsspecial durable design! Â· It is easy to set up and fully portable giving theability to carry it while travelling or camping! You will also get a strongcarrying bag COMPLETELY FREE! Our unrivaled castle is suitable and comfortablefor more than one kid, effectively increasing his sociability! 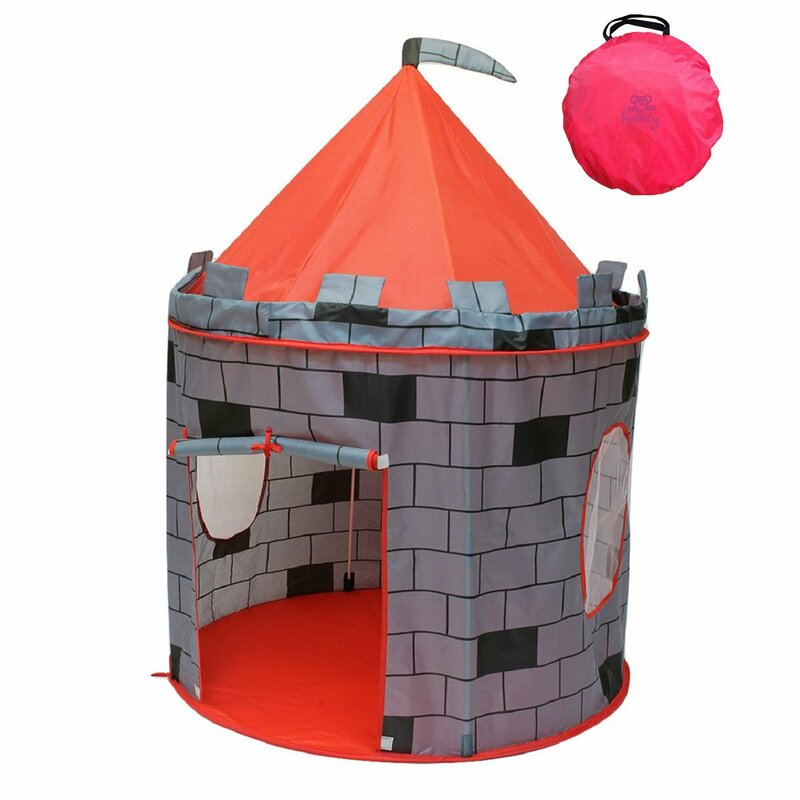 â€KNIGHTS CASTLEFEATURESâ€ â˜… Perfect size at 53â€ Ht X41â€ Dia, big enough for 2+ kids â˜…Manufactured with quality Polyester Fabric that Will Stand up To Years OfHeavy Play â˜… Comes with 4 sturdy poles for quick and easy assembly with notools required â˜… Ideal for home, backyard, parks, parties, day care â˜… 4 groundpegs to secure when used outdoors â˜… The fabric door rolls up & down for easyaccess â˜… Mesh windows allow visibility and air flow but keeps bugs out â˜…Compact when folded. Easy to storage anywhere only 18â€ X 2â€ â˜… Easy to followstep-by-step instruction included â˜… Bonus! Get free convenient carrying caseWhat are you waiting for? Make The Decision You Will Never Regret Click -AddTo Cart- Now, While There Is Still Time!